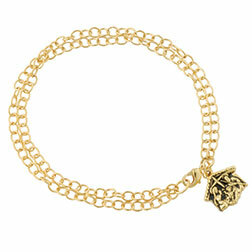 This gold plated bracelet features an intricate manger scene with a cute lamb detail on back. Presented in a beautiful holiday gift box ready for giving. Our gold-plated Christian jewelry designs are handmade from 100% lead-free pewter and triple-plated in 22Kt gold. Comes on an 8 inch cable chain with lobster clasp. 1/2"H x 9/16"W. Made in the U.S.A.